You forgot to download Remedic	. Click the link below to download it. Remedic, a free medical application for Windows-powered machines, provides information about home remedies and information about fruits and their benefits for your health. 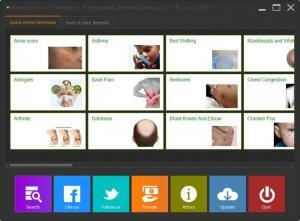 From the application’s interface you can access home remedies for baldness, knee pain, wrinkles, and other health issues. Remedic works with Windows 8, Windows 7, Windows Vista, Windows XP, Windows Server 2008, and Windows Server 2012. Please note that you need to have .NET Framework 4.0 or newer for Remedic to work properly. The developer recommends you run Remedic with admin rights to avoid any problems. Once the installation process completes, you will be taken to the Remedic page on Facebook. Quick Home Remedies – view home remedies for acne scars, asthma, allergies, bedsores, chest congestion, constipation, dandruff, food poisoning, hair loss, headaches, knee pain, sore throat, wrinkles, and other health related problems. Fruit & their Benefits – find out how your health benefits if you consume bananas, dates, lemons, olives, oranges, pears, raisins, and other fruits. By default, Remedic uses yellow Comic Sans font to display information on its interface. There’s a dropdown menu that you can use to change the text color and another dropdown menu that you can use to change the text font. Remedic is free software. If you like the application and you would like to support its development, consider making a donation. From Remedic’s dark themed interface you can easily access info about home remedies and you can see what benefits come with consuming fruits. Remedic provides support for numerous Windows editions; a wizard will quickly install the application on your PC. Remedic has a dark themed interface that is good looking and easy to navigate. View home made remedies for numerous health problems. Find out how your health benefits if you consume fruits. Remedic is free software (consider making a donation). An applications manager will be installed alongside Remedic. You need to run it in admin mode to avoid problems. The text reverts to the default formatting when you close the application. You can download Remedic free here.